Since Kim Jong-un came to power in late 2011, North Korea’s unofficial markets have been experiencing rapid changes to the extent that they may be called ‘the logistics revolution.’ Along with the expansion of state-run mobile telecommunications and spontaneously formed private transportation services, unprecedented market activities are emerging. North Korea’s mobile telecommunications service provider is now estimated at more than 4 million subscribers, close to 20% of its entire population, facilitating timely communication of market trend information. This allowed the merchants to determine quantities and prices of products to trade as well as shipping and delivery methods over the phone. The merchants can no longer compete in the markets without a cell phone. In addition, Kim Jong-un’s tolerance of private enterprises within North Korea, and the creation of de facto public-private collaborative operations have helped foster the private transportation services enterprise, also known as “servi-cha.” Railways were long North Korea’s principal mode of transportation. However, beset by economic difficulties and poor electricity supply, the system became unreliable, leaving a fleet of vehicles to rise as the primary mode of commercial transportation and enabling the proliferation of these privately run servi-cha. Marketization under the Kim Jong-un era has even made possible North Korean-style parcel delivery services. Gradually disappearing “door-to-door” merchants who used to travel long distance to make profitable trade, coupled with the ability to operate a chain supply through a phone call, connecting traders, drivers, and even checkpoints, has opened up a new business era of “stay-at-home” merchants. As such, the combination of mobile telecommunications and private transportation services has created a synergy effect, complementing one another to greatly increase the efficiency of unofficial markets in North Korea. However, there is very little research done on this combination phenomenon. In studying North Korean marketization, most researchers often fail to see the big picture by separating mobile telecommunications and private transport services as individual subjects. Even if there is a mention of ‘the logistics revolution,’ which is a result of the combination phenomenon, there is no further analysis other than relating it back to marketization. Considering North Korea’s reality of great increase in mobility of people and products off the regime’s radar, and rapid expansion of market information dissemination through mobile telecommunications, the aforementioned “combination” is a core element in determining the changing direction of North Korean marketization. This research intends to explore how cell phones are being utilized in communicating and exchanging information between actors associated with private transport services (servi-cha), and the resulting ramifications on markets. First, I assessed the cell phone communication method between the main actors, such as the owner of servi-cha, driver, client (merchant), broker, fuel oil trader, and checkpoint. Then, I examined the changing content and quality of private transportation services through the new communication method, and by extension, the trade method, scale, and how credibility plays into changing the relationship between the main actors of North Korea’s unofficial markets. This report is primarily based on interviews conducted between September 2016 andFebruary 2018 with 19 North Korean defectors who are now resettled in South Korea. The interviewees all have experience as merchants using both cell phones and private transportation services after Kim Jong-un came to power. Two of the defectors also have experience operating servi-cha. The defectors, with age distribution between their 20s and 50s, are from the capital city of Pyongyang, Hyesan, Samjiyon, and Baekam (Ryanggang Province), Hamhung (South Hamgyong Province), Chongjin (North Hamgyong Province), and Wonsan (Gangwon Province). The interviewees have relatively recently defected from North Korea, between 2012 and 2016. Detailed information on the defectors is not revealed to protect their identities and the safety of their remaining family members in North Korea. To get updated information, the author interviewed some defectors who currently maintain contacts in North Korea. North Korea’s commercial mobile telecommunications services began in November 2002, introduced by Thailand’s Loxley Pacific in Pyongyang and the Rajin-Sonbong (now referred to as Rason) Special Economic Zone (SEZ).North-East Asia Telephone and Telecommunications Co., Ltd. (NEAT&T), a joint venture between Loxley Pacific and North Korea Post andTelecommunications Corporation, provided 2G GSM service with the acquisition of a 30-year business license. NEAT&T expanded the coverage area to Nampo, Kaesong, provincial capitals, and major highways. By the end of 2003, the number of subscribers was estimated to have reached around 20,000. However, in April 2004, following a massive explosion at Yongchon Station in North Pyongan Province, North Korea shut down mobile telecommunications services. Along with the rumor that it was a bomb targeting Kim Jong-il, remotely controlled by a wireless handset, all cell phones were banned across the country and North Korea began confiscating devices. However, in December 2008, four years after the incident, North Korea lifted the ban on cell phones and resumed services. This time, they changed their business partner to the Egyptian telecommunication firm Orascom, established CHEO, and began servicing 3G W-CDMA under the name Koryolink. Owning 75% of shareholding, Orascom was granted a 25-year business license and secured a 4-year franchise. North Korean leadership, at the time, was politically desperate for mobile telecommunication services and needed to attract extensive foreign investment. In order to demonstrate that North Korea had reached its goal of becoming a “Strong and Prosperous Nation”by the 100th birthday of Kim Il-sung on April 15, 2012, they needed such economic achievements. In this sense, it was no coincidence that the phone number early Koryolink subscribers received included the digits 1912, inspired by the birth year of Kim Il-sung. By the end of the third quarter of 2011, three years after its service launching, Koryolink had established 453 base stations. As such, Koryolink expanded its network coverage including the capital Pyongyang, 15 major cities, 86 smaller cities, 22 major roads, and highways. Though this only covers 14% of North Korea’s territory, excluding the sparsely populated mountains and uplands covering most of North Korea’s land area, the network covers 94% of the entire population. According to defectors, at the beginning stage of the mobile telecommunication service, calls were only stable in Pyongyang and surrounding major cities. Calls were often disrupted in Sinuiju, Hyesan, Musan, Hoeryeong, and Chungjin due to a weak network connection. However, as service expanded, call quality is said to have greatly improved. At the time when Koryolink launched their 3G service, it was widely expected that the service would only be provided to a few privileged individuals. However, the Koryolink network rapidly expanded its number of subscribers in a short period of time. When the service was first launched in late 2008, the number of subscribers stood at about 2,000. However, that number reached one million in February 2012, three years after Koryolink service launching. In May 2013, 15 months after reaching one million, the subscriber count yet again presented remarkable growth totaling around two million. Thereafter, after a phase of stagnant growth, the number hit three million in November 2015 after another two years and six months. Some institutions speculate that the number of subscribers reached 3.7 million in late 2016, but as Orascom has been reporting the number of its new subscribers intermittently, the exact count is difficult to verify. North Korea has transitioned from a monopoly mobile telecommunication service market dominated by Koryolink to an oligopoly market structure. Since the early 2010s, with Ministry of Post and Telecommunications in North Korea as the sole investor, North Korea began to build a second mobile telecommunication network called ‘Gangseong Net.’ It is known to have started providing service to North Koreans in October 2013 under the name Byol. It is estimated that Byol had obtained up to one million subscribers by early 2016. The estimation made by South Korea’s National Intelligence Service of 4.7 million cell phones in use in North Korea in August 2017 appears to be combining the number of subscribers of both Koryolink and Byol. In the early years of Koryolink service, due to the limited cell phone supply and eligibility for subscription, the main customers were high-ranking officials representing the Party, government, military, and merchants who were able to bribe them. However, as the North Korean government relaxed some regulations, unless a specific problem was found during a background check, anyone with financial means could use cell phones. As such, the use of cell phones among the merchants proliferated and this made cell phones not only a symbol of financial and business prowess, but also a means of survival. Though the North Korean government had blocked the Internet and international calls, and even transmission of data by the end of 2011, the merchants had no problem checking jangmadang prices, exchange rates, and other such market information in real time. Already in the 1990s, during the North Korean famine, among cross-border traders who were using illegal Chinese cell phones to communicate, there was a saying that “As long as there is a cell phone, you can survive.” The situation was such that the determining factor of business success or failure was market information. In such circumstances, the construction of a North Korean wireless network signifies an opening of nationwide business opportunity for merchants. Wholesale and retail merchants of the jangmadang are now able to investigate and confirm market trends across the state to promptly respond to changes. Negotiations now conveniently take place over a phone instead of meeting at the market, also allowing decisions over price, quantity, shipping, and delivery methods to be made over the phone. On this account, cell phones have become an essential tool for merchants, making it impossible to survive in the jangmadang without a phone. According to defectors, long gone is the term ‘runner’ merchant, long distance trader who would carry his goods to the market, as now only with a couple of phone numbers of wholesale and retail sellers, and truck or bus drivers, one can operate a business as a ‘stay-at-home’ merchant. As such, with the rapid transmission of market information and improvement of distribution speed and range through cell phones, commodity prices have been stabilized, and trade methods taking advantage from price differences between regions are no longer feasible. North Korea’s transportation system was traditionally centered on the railways. However, with the economic crisis in the 1990s, the railway system was no longer able to function due to the endemic energy crisis and the deterioration of locomotives and railroad tracks. As the nation’s transportation service dwindled, North Koreans who were struggling to overcome the economic crisis created markets as a survival tactic, which in turn increased the demand for passenger and merchandise movement. As a result, a private road transportation system began to develop and business vehicles called ‘servi-cha’ were introduced. As a matter of fact, ‘pay-to-operate’ vehicles were available even before the economic crisis. Vehicles owned by the military, factories, and enterprises illegally transported passengers and accepted fares. These ‘commercial’ vehicles began to “corporatize” in the mid-1990s during the economic crisis. Enterprises, military and state institutions went on to conduct business with state owned vehicles and imported used vehicles from China or Japan. Especially with the expansion of the smuggling between North Korea and China and the resulting increase in the demand for transportation, private citizens began to pay bribes to state institutions in order to participate in the servi-cha business. Private citizens with capital—Korean Japanese, overseas Chinese, merchants, and those whose family members defected and resettled in South Korea, sending money back home—smuggled in used vehicles from China or Japan. Now, some enterprises and military bases operate servi-cha by renting out their vehicles to private citizens for a fee. The robust growth of servi-cha expanded the variety of transportation methods from freight trucks and military trucks to buses, vans, motorcycles, and taxis, satisfying the various demands of the market by operating both short and long distances. Such changes also gained momentum under Kim Jong-un’s regime apparent leniency toward markets. Under Kim Jong-il, Kim Jong-un’s father, the regime went back and forth between tolerance and regulation of markets. However, when Kim Jong-un ascended to power, he went beyond tacit approval, devising policy aimed to actively utilize markets. Even in the private transportation service markets, there had been repeated broad scale crackdowns on vehicles used for profit in the past. However, according to defectors, at least since 2014, there have been almost no broad-scale crackdowns. There is even a concern of ‘oversupply’ among the vehicle owners with the revitalized private transportation services. On this account, despite the rising gas prices, servi-cha are experiencing difficulty in raising freight rates. Once the vehicle is registered, the Ministry of People’s Security General Bureau of Transportation, which oversees the Department of Motor Vehicle, issues a permit for long-distance operation. The drivers must present this permit at checkpoints. North Koreans need to carry a travel permit issued by their provincial office of the Ministry of People’s Security to go outside their residential district. However, as servi-cha is classified as a business vehicle, the drivers and users of servi-cha are able to travel without the permit. The license plate indicates the institution it is registered with and therefore vehicles registered with such institutions as the Ministry of State Security (formerly known as the State Security Department), an institution of tremendous authority, are excluded from inspection and enforcement, but incur higher servi-cha operational costs. On the other hand, operating servi-cha with license plates from food industries, People’s Committees, and organizations in the agricultural sector is relatively cheap. Other than North Korean won, US dollars and Chinese yuan are also used to pay for servi-cha. Although the expansion of private transportation services in North Korea has caused dramatic increases in gas demand, the limited public distribution system failed to satisfy that demand. Satellite images taken in 2016 identified 82 official gas stations, and it is speculated that the number has increased steadily since then. The gas stations are mainly concentrated in downtown Pyongyang and its suburbs, and scattered throughout provincial capitals and main highways.Aside from this, the illegal fuel oil distribution system operated by individuals is dispersed throughout the nation, and the drivers of servi-cha are primarily using this system. The fuel oil traders either smuggle fuel oil from China and Russia, or buy the illegal outflow of fuel oil from military bases, oil reservoirs, factories, enterprises etc. The military bases appropriate fuel oil by fabricating training time, and enterprises sell fuel oil received from the state to the market and buy back from the market when needed. Such illegal circulation of fuel oil is rampant throughout the country, and because of deeply rooted corruption, it is very difficult to completely eradicate these illegal practices. North Korea has governed vehicle movements through checkpoints under the authority of either the Ministry of People’s Security or the Ministry of State Security. They check the validity of the permit, possession of a driver’s license, whether the vehicle is registered, and crack down on transportation of drugs and contraband. The checkpoints are established on provincial, city, and county boundaries and border areas. Temporary checkpoints are sometimes established at random. Despite abiding by all regulations, it is impossible for servi-cha to pass through the checkpoints without offering bribes. If the vehicle gets pulled over, transporting passengers and goods on time is impossible; therefore, the owners and drivers of servi-cha have no choice but to ‘cooperate’ with the checkpoint guards and officials. They periodically bribe the guards and officials according to service frequency and comply with requests for additional bribes. In North Korea, people call the bribe ‘homework.’ If the drivers of servi-cha ‘don’t do the homework,’ you are considered to have ‘low morals’ at checkpoints. The guards at checkpoints then begin ‘staying and finishing homework’ (extorting cargo). On the other hand, if the drivers offer a proper bribe to the guards, they can easily be given a pass even if caught red-handed running illegal activities. Because the collusion between servi-cha and checkpoints is deeply rooted, a crackdown on servi-cha at national level is not likely to be effective. In the case of extensive rigid enforcement of regulations, private transportation services may be paralyzed, and also face strong opposition from low- and mid-ranking officials who have been receiving bribes. With the dispersion of illegal fuel oil traders throughout the nation and the wide provision of cell phones, there has been a change in servi-cha owners and drivers’ gas purchasing behavior. In the past, the drivers often carried barrels of gas needed for the entire round-trip long-distance journey in the vehicle. Therefore, there was the inconvenience of not being able to maximize total cargo load. After cell phones came into wide use, vehicle owners were able to call fuel oil traders near the point of departure, travel stops, and destination to easily compare gas prices. Operators of servi-cha decide whether to load gas onto the car for the journey or purchase gas en route from the fuel oil traders after comparing the prices. Of no less importance than the price of gas is how much gas the fuel oil traders have in their current possession. A long-distance journey requires a large amount of gas, and it is of great importance that the drivers secure a fuel oil trader with enough gas in stock for the trip, and this can now be done efficiently by using cell phones. State institutions’ smuggling of gas has also become less risky and more convenient. According to the defector, before cell phones came into wide use, military vehicles delivered the gas barrels to private houses at dawn, and they always had to fear getting caught by the surveillance security officials. Even in the case of having gas delivered to a place other than a private home, there was also a chance of being caught by the security officials while waiting for the delivery. Thereafter, as cell phone calls were enabled, the time and place to meet could instantly be determined, and changes made just as easily as needed. It was said that the exchanges usually took place in the woods or fields where surveillance could not reach them. The defector also testified that cell phones are also helpful in delivering gas to a place without a specific address. The operator has to say that a driver out of gas had called him for gas delivery out on the road. After the distribution of cell phones, ‘gugahn’ (brokers) who connect the shippers and servi-cha for a handling charge have been active throughout all the regions. When a shipper approaches the owner of servi-cha directly, the owner of servi-cha may also contact brokers to run a background check to verify whether the shipper is trustworthy or not. With regular shippers, the owners of servi-cha often arrange cargo pickups through a direct phone call, and if a third party delivers the cargo, the servi-cha owners call the shippers to double check the content of the cargo before departure. On the other hand, a broker is contacted if the shipper is in need of a servi-cha immediately. The handling charge is paid by either the shipper or the servi-cha owner, but usually by the one who contacted the broker first. A broker can make easy profit once a good network of shippers and servi-cha owners is secured. However, as the broker is responsible for any damages, he also bears risks if something goes amiss in the introduction of the two parties. Brokers form a group by districts to exchange information. In each area, there is a ‘gugahnjang’ or a commander of the brokers who manage the group. Any broker who swindles is ‘dealt with’ by the commander and expelled from the market. According to defectors, after the wide circulation of cell phones, verification of information has become so speedy and easy that it has become very difficult for brokers to cheat. Brokers may also create a network with those from other districts to connect servi-cha owners and shippers. For example, let’s say there is a servi-cha departing from Pyongyang to Hamhung, South Hamgyong Province, after being introduced to a shipper by a local broker. The servi-cha owner or driver would contact the Pyongyang broker to communicate with the Hamhung broker to seek shippers so that he may load his vehicle with cargo when returning from Hamhung. Then, the Pyongyang broker would contact a Hamhung broker from his network to ask for a shipper who has cargo for this servi-cha. The Hamhung broker would then look for shippers in search of a servi-cha using his cell phone, and connect them to the owner or the driver of the servi-cha. Regardless of whether they have actually met in person, the Pyongyang broker and the Hamhung broker can maintain their business relationship using cell phones. The brokers also share information regarding where to send what type of cargo to maximize profits. Those who are not able to secure a network of shippers and servi-cha, and go around train stations, bus terminals, jangmadang, and inns looking for servi-cha passengers are called ‘forwarders.’ Their targets are often out-of-town citizens from other regions who are not familiar with local servi-cha. The forwarders connect the out-of-town citizens to a servi-cha that goes to their destination by asking their contacts using a cell phone. They then gain handling or facilitation fees from the servi-cha owners or drivers. Cell phones are also playing an important role in forming and invigorating a cooperative network of owners and drivers. Although social networks such as Facebook and Twitter are banned in North Korea where the Internet is blocked, enough information exchange is actively taking place using cell phones among drivers and owners of servi-cha. For instance, if a servi-cha breaks down or is at a repair shop, but the owner receives a call from a broker or shipper, he then directs the call to another servi-cha driver or owner he is regularly in contact with. In addition, the cooperative networks created using cell phones also benefit when it comes to repairing vehicles and supplying spare parts. If an unexpected event occurs at checkpoints, phone calls are made to notify the servi-cha owners and drivers who are operating along the same route. In the case that servi-cha is caught by security officials or checkpoint guards, someone from the network may come to the rescue, and this, too, is quickly done through cell phone communication. If a problem occurs at checkpoints while operating servi-cha, then offering a bribe is the fastest way to resolve the problem. If a guard at a checkpoint asks for more ‘generosity’ or for dolsang (a Korean traditional special feast table laid in celebration of a baby’s first birthday), it is wiser to just bribe more and be let go in peace even if it means suffering a financial loss. The refusal to comply would first disturb the delivery schedule, possibly result in confiscation of the cargo, and create future tension and conflict by aggravating the relationship with the checkpoint guards. However, when illegal cargo is discovered or an order to rigidly enforce regulations is passed down from the top, it may become complicated to use just a bribe as a means to reach a deal. In such cases, guards with whom the operators have had a long relationship and cultivated through bribes over many years may change their attitude. The worst-case scenario would be to have cargo confiscated, and under such circumstances, the servi-cha owner or driver immediately contacts the shipper to explain the situation. Then, the shipper calls the recipient of the delivery to discuss a countermeasure. If the owner of the servi-cha has connections with high-level officials of the Ministry of People’s Security, then he can contact them directly to describe the circumstances, which would then lead to the high-level official calling a mid-level official to order the immediate release of the servi-cha stopped at the checkpoint. Ministry of State Security checkpoints are even more difficult to pass. One defector disclosed that once he passed through the checkpoint by calling a broker to find out the name of a high-level official of the Ministry of State Security in order to lie to the guard that he was the nephew of that official. For the users of servi-cha, the greatest benefit from the widespread use of cell phones is the ability to compare freight charges in real time to select the best-suited servi-cha. The users of servi-cha make a direct phone call to the owners, drivers, or brokers to ask for such details as departure time and date, freight charges or fares, vehicle types (in the case of passengers, a freight car is cheaper than a bus), and seat availability (if no actual seats are available, one must sit on the truck bed or the aisle floor on the bus). Using cell phones, the users also share information between one another related to freight charges, fares, and trustworthiness of servi-cha owners and drivers. Under such circumstances, comparisons and resulting complaints are made regarding, for example, discrepancies in the quality of cars provided for the same cost, or people charged higher than others for booking the same route. Correspondingly, the active exchange of information naturally creates a ‘fair and reasonable’ price in the servi-cha market. In the case of a freight truck, depending on details such as operating distance, vehicle type, and cargo type, there is a fair and reasonable price per one metric ton or the market price is segmented accordingly. When there is rigid enforcement of strict regulations, a premium is expected on top of the standard cost. As the number of providers and consumers of servi-cha has greatly increased, and information circulation has become more active, fair, and reasonable, freight charges are being determined in the market. At the same time, the owners and drivers of servi-cha have colluded through cell phone conversations to fix prices. If a servi-cha lowers the freight charge and the news spreads that many shippers are flocking to do business there, other servi-cha owners may call this servi-cha owner to ask about the situation. If it is for some unavoidable reason, then the others may agree to lower their freight charge. However, if they cannot reach an understanding, then threats and sometimes violence may be used to raise the price again. Among the owners, there is a tacit agreement on freight charges, service frequency, and routes taken. For example, if the information is received via cell phone that someone new has entered an already existing route and is creating new competition, intense pressure and punishment amounting even to physical violence may follow. Unexpected situations may occur during the long-distance operation of servi-cha. Possible delays may result from vehicle mechanical problems, a flat tire, or detainment at checkpoints. Before the widespread circulation of cell phones, in the case of such delays, both the sender and the recipient had to wait indefinitely without any information. However, today, if there is an interruption or disruption in transportation time, the driver has to call both the shipper and the recipient immediately to explain the situation. If the driver irresponsibly fails to communicate, then the servi-cha will lose its credibility not only with that one client, but also with the whole community of servi-cha users. The users, when informed of the changes in transport schedule through cell phones, can quickly take responsive measures to minimize the negative impact. In order to gain credibility and reassure the shippers, it is necessary to make a phone call from time to time (every hour or once every few hours) and inform on the current location and estimated arrival time. For long-distance transport, the drivers may take a break to have a meal at privately run restaurants, and it is also better to notify the shipper of the stopover and current situation. However, sometimes, there are drivers who abuse this. As servi-cha expanded, the number of restaurants serving as rest areas on the roadside increased. The restaurants not only sell food, but also make a profit by buying gas from drivers and selling it back to the other drivers at a higher price. Servi-cha drivers usually choose familiar restaurants, but if they need to make a stop at an unfamiliar place, they call people who are familiar with the area to find a suitable restaurant. If the merchant himself delivered or picked up the products to and from a client using servi-cha, then it often meant days’ worth of time wasted on the road, physical exhaustion, and dangers of loss and theft. Besides the freight charge, the passenger fare for the merchant and the cost of their own meals were business expenditures that reduced the total profit. There is also a limit on the amount and weight of goods a merchant can carry. The North Korean post offices also provide package delivery services. However, not only does the delivery take a long time, but the packages are also often damaged and prone to mishaps. There is pervading distrust towards the services offered by the post office. Servi-cha owners who have taken notice of this deficiency have opened up active parcel delivery businesses. The way this delivery system works is that the sender tells the recipient the information of the vehicle and the driver’s cell phone number, and gives the recipient’s cell phone number to the driver. Upon arrival near the destination area, the driver calls the recipient and they communicate directions to the meeting point to successfully complete parcel delivery. Though this entrepreneurial parcel business is not on par with modern parcel delivery service standards, considering the inadequate distribution conditions in North Korea, it is employed as a relatively quick and accurate delivery service. As such parcel delivery business advances, the number of ‘joonggae-cha,’ or trucks specialized in delivery services for cargo, are also on the rise. Especially if a shipper is sending expensive goods, he will not allow any passengers on the flatbed or in the trunk due to the risk of theft. If the cargo disappears or is damaged en route to its destination, the owner or the driver must take responsibility. Even if the truck is empty, if it is on its way to pick up cargo, a joonggae-cha will not pick up a passenger whether or not he or she is willing to pay the fare. The earning of a small sum in passenger fares is not worth risking the vehicle getting pulled over at a checkpoint or experiencing delays while trying to drop people off at their destinations. Especially in the case of joonggae-cha specialized in expensive cargo, timely arrival at the appointed time is crucial in maintaining credibility with the shippers. Cell phones have made revolutionary changes in North Korea’s private money transfer system. Donju (“money masters”), who have made a large fortune trading in outdoor markets known as jangmadang, are facilitating efficient money transfers through their financial networks and using their mobile phones. Depositing money in the official banking system of North Korea makes it almost impossible to withdraw money. Consequently, North Koreans are hiding money in their homes and making transfers as needed through private networks. Let us look at an example. A, a wholesale merchant in the border city of Hyesan, sends smuggled Chinese goods through servi-cha to B, a wholesale merchant in Hamhung, South Hamgyong Province. B sells the smuggled goods to retail traders at the jangmadang, and then settles the deferred payment to A for the goods purchased. The money does not actually move from Hamhung to Hyesan, but an ‘ikwan-jib,’a ‘transfer house’ (unofficial financial transfer services) operated by a donju, functions as a bank between Hamhung and Hyesan. If B goes to a nearby ‘ikwan-jib’ to transfer money to A, the ‘ikwan-jib’ of Hamhung contacts a known ‘ikwan-jib’ in Hyesan to give money to A. Then, after receiving money from the ‘ikwan-jib’ in Hyesan, A calls B to confirm the receipt of payment. Between ‘ikwan-jib,’ they have a separate clearing system and also perform money transfer services without trading of goods. 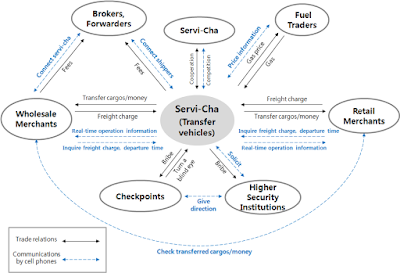 As the combination of servi-cha and cell phones has expanded ‘sedentary business,’ there has been widespread use of methods of transfer such as sending settlement costs in cash through servi-cha drivers (ikwandon or transfer money), or purchasing and sending products requested by a client. The drivers, in return, can take ‘transfer fees.’ Due to the relatively large cargo traded and transported by ‘sedentary businesses,’ resulting settlement costs are also high. In the past, it was difficult to imagine entrusting the delivery of a large amount of money to another person. Fundamentally, as credit transactions were not established, only direct cash transactions were made, and there was even a running joke that “anyone who gets back money that was lent is a hero of the People’s Republic.” However, today, the sender, recipient, and driver can communicate with each other using cell phones to verify accurate money delivery, and this also gives more incentive to the drivers to ensure flawless delivery of the money in order to maintain credibility. In the case of settling a small sum, the method of transferring call minutes is used. The person who needs to send money charges call minutes on his phone and sends the minutes to the person to whom he owes money. A maximum of one million North Korean won worth of minutes can be transferred, which is the equivalent of about 130 dollars at the black market rate. This method has often been used when sending money to a child who is in the military or to relatives as a wedding gift, and now is also commonly used to make small payments among the merchants. The recipient of minutes can transfer the minutes to other people or to professional minutes traders once again for money. This indicates that some sort of secondary market for minutes is in operation.The monthly price for a basic plan including 200 minutes with Koryolink is only about 10 cents in US dollars, but the price for a rechargeable prepaid card for call minutes is more than 10 times higher.Therefore, minutes in the aforementioned secondary market are treated like a prepaid card and are traded at equally expensive rates. However, the market price is open to negotiation and is largely dependent on one’s ability to haggle. Consumers are also benefiting from the innovation in logistics that resulted from the combination of servi-cha and cell phones. As the merchants are responding quickly to changes in market conditions, product supply to the jangmadang has been smooth. Inter-regional price discrepancies and price hikes have been greatly reduced. In particular, the price of Chinese industrial products has been significantly reduced to the extent that their Pyongyang market prices are almost the same as their actual prices in China. As a result, a sales strategy targeting regional price differences no longer yields a big profit, and this has led to a ‘small profits and quick returns’ approach emerging as the new sales strategy. The reason bulk sale has become possible is because the distribution of cargo trucks in North Korea began with the development of the servi-cha market. While Chinese Dongfeng trucks with a load limit of 5-10 metric tons were heavily smuggled in the 2010s, trucks with a load limit of 20 metric tons have been preferred in recent years. The operating cost of a 20 metric ton truck is lower than that of two 10 metric ton trucks. However, trucks over 20 metric tons are difficult to operate under the poor road conditions of North Korea. According to a defector who frequently communicates with a North Korean source, Chinese-made 20 metric ton trucks are traded at $45,000 for a new one and $35,000 for a used one with an odometer reading of about 100,000 miles. After the economic crisis in the mid-1990s, the jangmadang rapidly expanded and this also led to the uncontrolled flourishing of various fraudulent activities. The jangmadang was a hotbed of business activity that used unconventional methods for survival. Selling adulterated food and cheating the scales were common at the jangmadang, often leading to a brawl. The will to provide satisfactory service for clients in order to create a stable long-term relationship was a rare sight among the jangmadang merchants. However, as marketization continues to progress, the importance of credibility has also increased in North Korea. The combination of servi-cha and cell phones has made it almost impossible to survive in markets without credibility. The credibility of servi-cha is first and foremost dependent on accurate and timely delivery. As such, the driver must keep both the shipper and recipient regularly informed on his current location and status, and he must immediately notify them when an emergency occurs. If a driver neglects such duties, he will earn a reputation as an irresponsible and untrustworthy driver. This is also the reason why empty joonggae-cha specialized in expensive cargo never picks up a passenger on the way to pick up cargos; it is to maintain credibility with VIP shippers by staying on schedule. Also, in the case of money transfers, a ‘sedentary merchant’ would not be able to entrust large payments to a servi-cha driver if the premise of credibility is not guaranteed. In the past, North Koreans called money lenders or people who repay the loans ‘morons.’ The tendency was that no matter the reason, if one came into possession of someone else’s money, it was considered his. Now, however, this behavior and way of thinking can no longer operate with servi-cha. A driver without credibility has no more footing in the market. As the driver, sender, and recipient can all verify accurate money delivery using cell phones, swindling has become difficult for drivers. On the contrary, among the owners of servi-cha, some even offer loans at low interest rates to shippers in order to strengthen credit relationships. The combination of servi-cha and cell phone under the Kim Jong-un era gave birth to North Korean-style logistical innovation. Assisted by the rapid exchange of information, the system is evolving to create close ties between servi-cha, wholesale and retail merchants, brokers, fuel oil traders, checkpoints, and other associated actors along the chain. Bringing in new servi-cha customers, pricing freight charges, transferring money, trading gas, and tense situations at checkpoints are all being managed efficiently through communication via cell phones. Along with the development of a North Korean-style parcel delivery services based on these changes, the era of ‘sedentary business’ has begun. A new system of logistics has brought about specialization to the process of distribution. Moving away from the previous method involving merchants delivering cargo themselves, the actors have come up with a division of labor and role assignment while dealing with shipping, transporting, receiving, and selling. As a result, costs have been reduced, risk has been distributed and mitigated, cargo volume has expanded, and swift, quick product supply has been made possible in response to changes in market conditions. These structural changes benefited consumers by stabilizing the price of goods. Since sales strategies based on exploiting price differences across regions has lost its competitiveness, the quick-returns policy has emerged as the new sale strategy. Under such circumstances, the influence of donju known as the ‘red capitalists’ continues to grow, widening the income gap among merchants. 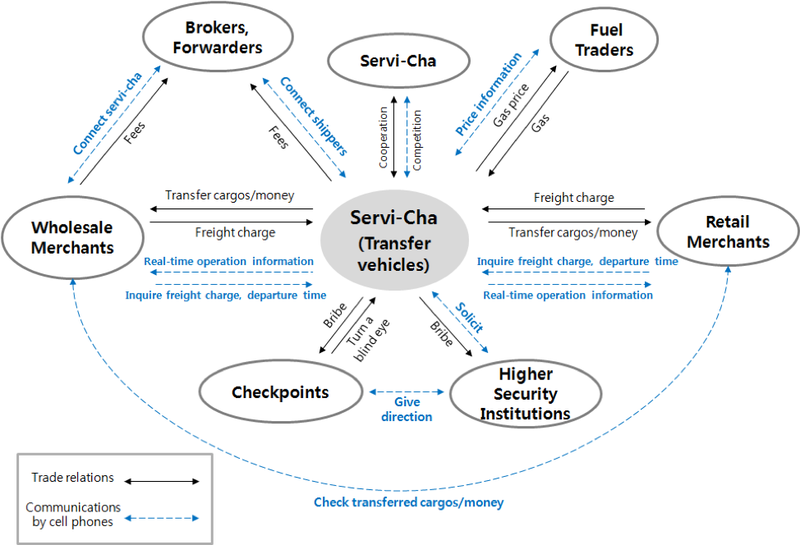 The combination of servi-cha and cell phones has facilitated long-term and stable trade relationships, and developed a credit-based logistics system. The expansion of the trade scale has also increased the risk of business failure, and as a result, it is difficult to guarantee the operation of the new logistics system without much needed credibility. In fact, in order for the market to develop, contracts must be fulfilled and the predictability of trade relationships must be secured through legal and institutional arrangements. However, as evidenced by peoples’ deep-rooted distrust in the parcel delivery system of the Ministry of Post and Telecommunications and the official banking system, the state is unable to properly support its markets via laws and institutions. Quite the contrary, the state criminalizes many entrepreneurial activities through its own Criminal Code. However, ironically enough, declining state functions and corruption result in the state institution’s involvement in smuggling, trafficking fuel oil, and bribery at checkpoints. Widespread state corruption is, in fact, promoting marketization. The predictability of trade relations in the North Korean market has been made possible through the awakening of the self-interested market participants who realized the importance of credibility in the trade relationship cycle and pressured for the prevention of fraud using rapid informational exchanges via cell phones. Contrasting with the public service of 3G mobile telecommunications decisively provided by the government under the Kim Jong-un era, servi-cha is a spontaneous service product that was created in the market to fulfill internal demand, which the state was compelled to accept. Market participants shaped the new logistical system by taking the lead in combining cell phone and servi-cha. Market participants led the dynamic advancement of the market, and the role of the state was diminished to no more than that of a supporting actor. In the early stages of cell phone distribution, North Koreans acknowledged the state’s provision of the latest mobile telecommunications services and expressed pride. However, according to defectors, as the combination of cell phones and servi-cha progressed, rather than feeling gratitude for the mobile telecommunications, there was growing dissatisfaction with decreasing profit due to state regulation on jangmadang, labor mobilization campaigns, and corrupt officials. At least among the market participants, the state is recognized as the disrupter of market activities. A rift appears to have emerged, putting the state at odds with the people. However, powerful donjus among the market participants have affiliated themselves with state institutions, earning foreign currency and pocketing money on the side. These actors span between the state and the market, and their calculations and reactions in regard to the rift between the state and the people must be followed closely. The specialization in the distribution chains and proliferation of bulk sales will inevitably require the maintenance and development of road infrastructure in North Korea. The private fuel oil supply system, heavily dependent on smuggling and trafficking from state institutions, will eventually have to be replaced by a legal supply system. As time passes, fuel oil demand will continue to rise and, as a result, an increase in North Korea’s vulnerability to international oil sanctions is highly probable. On the other hand, it would be reasonable to assume that the increased mobility of people, products, and information has already reached an irreversible level. Kim Jong-un’s regime may be able to take measures against the market over the short term. However, it is likely aware of the truth that such an approach is not sustainable. In addition, it was the new logistical system that may have prompted North Korea to show efforts to focus on systematic economic development after declaring the completion of its nuclear arms capabilities. The word comes from “service” and car in Korean “cha.” See also Ju-min Park, James Pearson, “In North Korea, Deals on the Bus Make Markets Go Round,” Reuters, September 10, 2015. See Seok-ki Lee, Moon-su Yang, Enu-yi Jung, “Analysis on the Markets of North Korea (Korean),” Korea Institute for industrial Economics and Trade, 2014; Yonho Kim, “Cell Phones in North Korea: Has North Korea Entered the Telecommunications Revolution?” U.S.-Korea Institute, 2014. These areas have an active commercial transaction and distribution, and are connected with other major markets across the nation. Hyesan and Samjiyon of Ryanggang Province, especially, are in close proximity to China as border cities and are main smuggling sites. The majority of products distributed in North Korea are made in China, are imported by means of trade and smuggling, and are distributed nationwide through wholesale markets. Stacey Banks, “North Korean Telecommunications: On Hold,” North Korean Review, Fall 2005, pp.88-94. Heba Saleh and Christian Oliver, “N Korea network expects millions of users,” Financial Times, February 2, 2010. Orascom Telecom Holding, “Earnings Release Third Quarter 2011.” No additional information on Koryolink’s operational performance, except for an intermittent press release and media interviews, is publicly available, after Koryolink ownership was transferred from Orascom Telecom to Orascom Telecom Media and Technology Holding (OTMT) in 2011. See Yonho Kim(2014) p.12. For information about Koryolink’s network covered area and its call quality, see Yonho Kim (2014), pp. 24-26. Orascom Telecom Media & Tech Holding (OTMT) Press Release "OTMT Announces the Adaptation of a Revised Accounting Treatment for its North Korean Subsidiary Koryolink and the Conclusion of its Acquisition of Beltone,” November 8, 2015. Hootsuite & We are Social, "Digital in 2017: Global Overview", January 24, 2017. Originally, Orascom was granted a four-year franchise until the end of 2012, and this license was extended for three years until the year 2015. Therefore, it is possible that North Korea broke the promise and unilaterally introduced a second mobile telecommunication service. This may also have been the result of Orascom failing to meet some of its contractual obligations.Regarding conflict between Orascom and the North Korean government related to repatriated profits, see Anna Fifield, “North Korea tells Egyptian company: Thanks for the cellphones. We’ll take the company, too.” Washington Post, November 19, 2015; Alastair Gale, “Orascom Suffers Static in North Korean Venture,” Wall Street Journal, January 1, 2016. Sung-hoon Park, “NIS ‘China, lack of cooperation on sanctions… booming North Korean economy despite continued missile launch’ (Korean),” JoongAng Ilbo, August 1, 2017. Kang Mi Jin, “Koryolink changes numbers for Kim Il Sung's birth year,” Daily NK, November 25, 2015. Young Chung, “North Korea, subscribers of ‘Koryolink’ moving to ‘Gangseong net’ (Korean),” Radio Free Asia, April 4, 2016. Young Chung, “Cell phone makes excessive profits decline (Korean),” Radio Free Asia, February 1, 2013. Im Jeong Jin, “Servi-Cha: the Lifeblood of the People’s Economy,” Daily NK, October 26, 2010. In the 2000s, the importance of vehicle transport was fundamental in the North Korea-China smuggling areas to an extent that sayings such as “the wheels make money” and “the drivers are making a fortune” appeared. Especially with the increase in the number of buses, beginning in the 2010s, a nationwide bus network has been created connecting major cities. Byung-yeon Kim, “Unveiling the North Korean Economy: Collapse and Transition,” Cambridge University Press, 2017, pp.275-6. Im Jeong Jin, “War Declared on the Servi-Cha,” Daily NK, October 25, 2010. Jun-ho Kim, “An excessive supply of popular servi-cha (Korean),” Radio Free Asia, August 24, 2015. According to defectors who regularly contact North Korean residents, in 2014, the price of gasoline was 5 yuan per kg, and in January of 2018, that price had tripled. However, fare rates ofservi-charemain similar,if not lower. Party agency-owned vehicles’ license plate numbers begin with the number 11 or 12, a cabinet or administrative division license plate begins between 12 and 14, People’s Committees license plates begin between 15 and 17, Ministry of State Security license plates begin between 18 and 20, Liaison office of Central Party license plates begin with 90, and railway traffic division license plates begin with 46. Jeong-min Noh, “A new gas station in Nampo… about 80 gas stations over the country (Korean),” Radio Free Asia, May 7, 2016. Kyung-sool Kim, “Petroleum Industry and Circulation in North Korea (Korean),” KDI Review of the North Korean Economy, Korean Development Institute, January 2018. Yeong-Hui Kim, “Targeting the well-to-do residents, new businesses are opening one after another (Korean),” Maeil Business Newspaper, January 1, 2015. Yeong-Hui Kim, “‘20 years of jangmadang’ have changed North Korea...Order using a cell phone and pay with private money transfer system (Korean),” Maeil Business Newspaper, January 1, 2015. Jun-ho Kim, “Servi-cha in North Korea are getting attention as parcel delivery business (Korean),” Radio Free Asia, October 2, 2014. This term is derived from the word “mediation,” as the vehicle completes the business deal by successfully delivering goods from point A to point B. “Donju run currency exchange business using cell phones (Korean),” Radio Free Asia, June 28, 2013. For North Korea’s private money transfer service through ‘ikwan-jib,’ see Yonho Kim(2014) pp.32-34. Because soldiers in North Korea are prohibited from using cell phones, when sending money to a child in the military, parents transfer the minutes through the child’s unit commander. Then, the commander cashes in the minutes and transfers the remainder without the amount corresponding to the bribe. In North Korea, a basic cell phone plan allows 200 free minutes per month for a quarterly service charge of around 3,000 won (less than 40 cents at black market exchange rates). After using up the 200 minutes, subscribers have to add minutes with a rechargeable prepaid card. In the case of Koryolink, they have to charge the card with foreign currency, which is 10-20 times more expensive than basic plan. See Yonho Kim (2014) pp.14-15. See Yonho Kim (2014), p.37.